Getty ImagesTesla CEO Elon Musk announces a project in Australia in September 2017. Several Wall Street analysts are worried that the company’s credibility could take a hit, since its valuation is highly linked to its prolific CEO. Now, as Musk said in a blog post, all focus can return to “ramping Model 3 and becoming profitable,” something that’s no more secured than before his cryptic tweet on August 7. 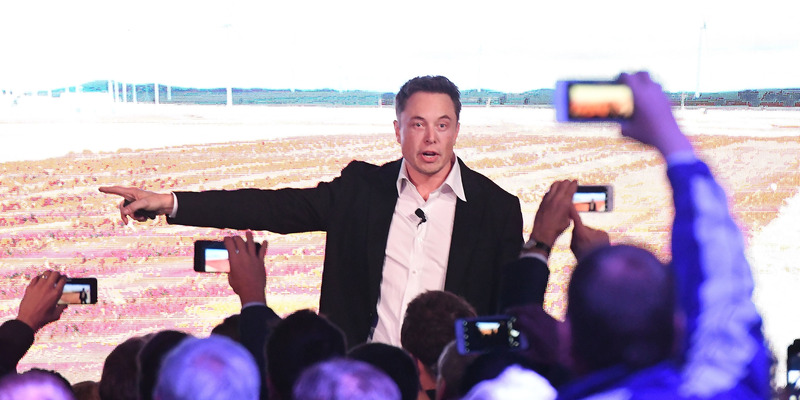 But Wall Street analysts – the very group Musk has publicly bemoaned – are worried that the less-than-three-week ordeal could have caused long-term harm to Tesla’s public image. Musk initially said that “investor support is confirmed,” but his blog post over the weekend explained that investors largely begged him not to take the company private. He also said the company can now focus on ramping production of the Model 3 – something it was struggling to do even before the go-private push. And with all eyes back on Tesla’s push to become a profitable company this year, another analyst says profitability may be as far away as ever. “Given the company is in a cash crunch currently, with cash excluding deposits at $US1.3 billion and debt maturities rapidly approaching, the tone from the company has started to change toward a more acute focus on profitability and cash management, which we appreciate,” Jeffrey Osborne, an analyst at Cowen, told clients Monday. In its latest quarterly report on August 1, Tesla said it had slowed its cash burn to $US739.5 million, down slightly from $US745.3 million in the previous quarter. The company also said its production rate at the time, of 7,000 Model S and X cars per week, would keep it on track for profitability. But one analyst isn’t as convinced. “We believe the company has learned the lesson the hard way that making cars is much harder than they had anticipated and find it hard to believe that 15 months into the ramp of the vehicle it can reverse the trends of losses to make the company profitable and cash flow positive in the September 2018 quarter,” Osborne said. Documents seen by Business Insider last week confirm Osborne’s worries. Of the 5,000 Model 3s produced in the final week of June – the output rate that finally made Tesla a “real car company,” Musk celebrated – 4,300 required significant reworking due to production errors. What’s more, a Model 3 disassembled by UBS analysts showed “significant issues” with the fit and finish including missing bolts and misaligned parts. Osborne, who has a $US200 price target for shares of Tesla, estimates the company will have to raise $US2 billion through convertible debt before the end of the fourth quarter, which would add to Tesla’s current $US11.5 billion worth of currently outstanding debt and could be tougher going forward following the go-private bid. Then there’s the fear of unforeseen costs created by the go-private sideshow. Wall Street analysts now have an average target price of $US329 for shares of Tesla – 27% below Musk’s $US420 target for taking the company private. Shares plunged more than 3% on the first day of trading following the announcement by Musk that Tesla will remain public.